Are people finally embracing Windows 8, 10 months after it first hit the shelves? The latest stats from Net Applications suggest that they might be: the embattled OS jumped from 5.4% market share in July to 7.41% in August, its sharpest rise yet. It's a rare case of good news for Microsoft and Windows 8, which market watcher IDC partly blamed for dismal PC sales back in April. But it still has a long way to go, indicated by the gulf between Windows 8 and Windows 7, which grew market share from 44.49% in July to 45.63% in August. Windows 8 also trails XP, the veritable zombie of the operating system world that still boasted 33.66% market share in August, even after a sharp drop from the 37.19% it held in July. It did, however, overtake Apple's OS X, which came in fourth at 7.26%, and it far surpassed ahead of Linux's 1.5%. Net Applications gleans its findings from data captured from 160 million unique visitors each month by monitoring 40,000 websites for its clients. Windows 8's 2% jump in market share was likely assisted by cuts made to Microsoft's Surface Pro, which saw $50 permanently lopped off its usual retail price in August. 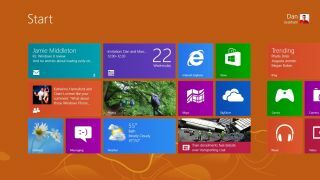 It will also be given a helping hand by the introduction of Windows 8.1 in October, which promises to rectify many of the original's teething problems – from the missing 'Start' menu to enhanced built-in apps and more flexible ways to snap apps side by side.